Pumpkin Cream Cheese Brownies are an easy brownie recipe that is perfect for fall. The brownies are impressive because the swirls look so fancy. But shhh … don’t tell others that the marbled effect is so easy to do. 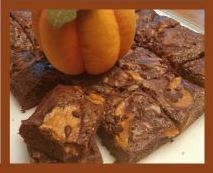 You mix together a standard brownie recipe and the pumpkin cream cheese filling in separate bowls and drop them separately into the pan. The trick? Drop a little at a time. Drop many small amounts of filling on top of the brownie base, rather than large dollops – and then allow some of the filling to peek through the top, too – before swirling through all the layers with a kitchen knife. This recipe a great way to use up some of that leftover pumpkin from making pumpkin bread, pumpkin pie, and pumpkin cookies. Preheat oven to 350º F. Line a 13 x 9 baking pan with parchment paper or aluminum foil. Spray the pan lining with vegetable spray. Make the filling: in a medium bowl using an electric mixer on medium speed, beat together the cream cheese, pumpkin, 1 egg, sugar, and cinnamon until the mixture is smooth. Set the filling aside. Make the brownie batter: in a medium bowl using an electric mixer on medium speed, combine brownie mix, vegetable oil, water, and 2 eggs until blended. Pour ¾ of the brownie batter into the prepared pan. Spoon tablespoons of the filling evenly over the batter. Spoon remaining brownie batter over filling, leaving a few spots of the filling showing for effect. 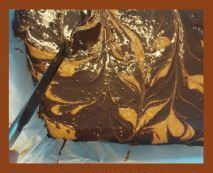 Use a knife to swirl the brownies and filling: insert the knife in one corner of the pan and moving it back and forth in the surface first horizontally, then vertically, to create a swirled design. Sprinkle brownie surface with miniature chocolate chips (optional). Bake 40-45 minutes until set and a toothpick inserted in the center comes out clean. Allow brownies to cool completely. For cleanest cuts, refrigerate the brownies for 30-60 minutes. Then lift pan liner onto a cutting board. Use a sharp knife to cut brownies into bars. You can use up to 4 ounces (half an 8-ounce package) of cream cheese in the filling. Filling will mix more evenly if you beat cream cheese first, allowing it to become smooth, and then add other filing ingredients. Drop small tablespoonfuls of the filling over brownie base (rather than large dollops) so that brownies bake evenly.